Ananka's Diary: My Condition Has Been Diagnosed! But as of today, I'm fascinated by a new disorder. 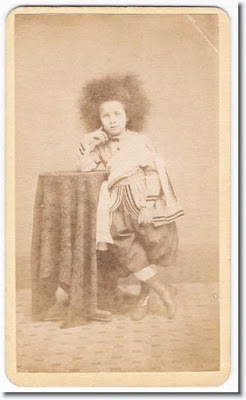 It's called Uncombable Hair Syndrome. People with this dreaded condition (shown below) literally CANNOT comb their hair. 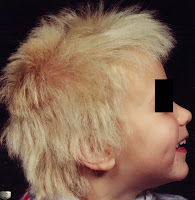 Sometime in late childhood, the hair of otherwise healthy individuals turns lighter--often a pale blonde. As it gradually grows drier, it develops a texture that's been described as "spun glass." (Think Barbie's hair after several years of makeovers.) Eventually, it reaches a stage where no comb can tame it. To date, the only treatment for Uncombably Hair Syndrome is a baseball hat. So I call upon all of you with an interest in science to search for a cure! My hair can get just like that! Lol, I thought my hair was bad! Gross, I went on the Wikipedia article! It's actually not hair on the tongue (thankfully). It's really the overgrown, darkened bumps on your tongue (EWW) from smoking too much! My health teacher told me that anywhere that comes into contact with the cigarette can get cancer - even the insides of your fingers! I thought you just made up Black Hairy Tongue. It doesn't sound like a condition that could actually exist. once i put soap in a barbies hair. i guess thats what it would be like. i feel bad for those people. by the way, how many languages does kiki speak? Ooh, so if I bleach my hair I'll have a pretend excuse to not brush it! We saw pictures of Black Hairy Tongue in health, along with lungs that smoked. They were all black and shriveled. ha ha ha! that's awesome! my hair is to oily for that. What if you shave your hair off your head? Would it grow normal again????? Have you heard of a disease called Vampire Disease? To find out more, go to http://www.geocities.com/researchguide/drkporphyria.html.